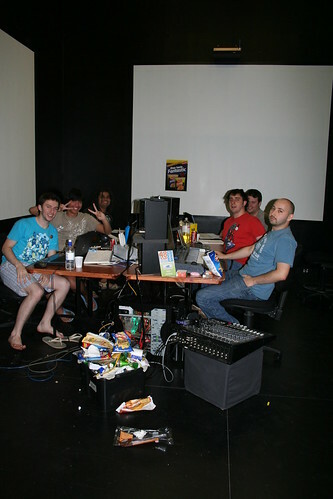 The 48 hour game making challenge in 2009 was supported by the Australasian CRC for Interaction Design (ACID), the Institute for Creative Industries & Innovation (iCi), Southbank Institute of Technology, QANTM, Griffith QCA Film School, QUT Creative Industries Precincts and Brisbane IGDA. 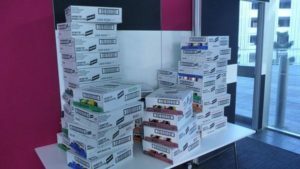 We were also sponsored by many local businesses who contributed food – we had bread and cakes from Gerbino’s who have continued to support us since, and even more Noodles …. We had to create a whole new league – the professionals “living the indie life” and so we had to take over the big space next door – the glasshouse. Showers: they were warmer if you went at the right time, air conditioning was still fierce or useless, the stakes were high and the games made by our compliment of 20 teams were just brilliant! 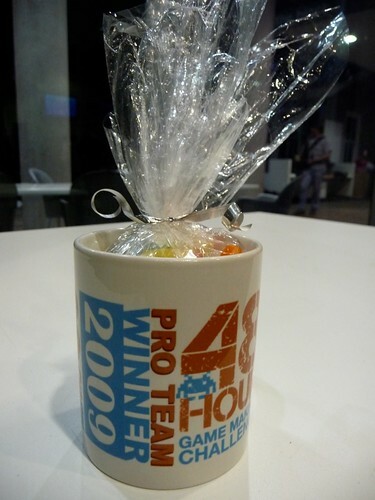 We introduced prize mugs and badges and we also introduced different categories of prizes: Pro-team Winner, Grand Champion Winner (not so ordinary teams), Audio Winner, Graphics Winner, and one that is still a favorite: “Who dares” Winner. It’s dangerous being a giant robot in love. At least that’s what Australian developer Curious Bear seems to believe, after playing their game “My Mechanical Romance” (PRO Team Winner of the Australian 48hr Game Making Challenge). So what could two giant robots really have to be afraid of if not the agonizing fear of dying alone. Well, lightning seems to kill ‘em pretty easily, and Christ they’re getting married on a stormy day. Protesters are also a major threat. It seems that the puny humans hate love, when it’s of the colossal and steel variety. So instead of playing as a giant robot in love, or angry lightning cloud/protester, you get to be the wind – an apparently kind and sympathetic sort that wants nothing more than to give the robots a chance at romance. Kitchen cam came into its own – with special thanks to our wonderful technical support – the awesome Chen. Portal Marmosets returned as Dimensionography and Leanne kept a blog of the event and the creation of their rather lovely game – A forest fair and still. Could it be the sacred wind? Day 36, and still no sign of rescue. Rations are scarce. Beginning to consider convenient ‘accidents’ for fellow crew members. May be risky, though – only thing available is Chicken Crimpy avalanche. If only we had some food, it might not have come to this. But poor planning, and the Tim Tam Andes, have left us vulnerable. I won’t wait. The Crimpies come down tonight. 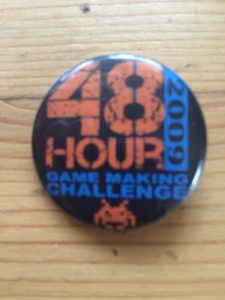 48hr Game Making Challenge 2009 – 3 hours to go! 48hr Game Making Challenge 2009 – 5 minutes to go! 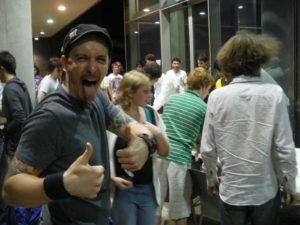 We were also featured on ABC local radio – once on the early morning show and later on Drive: Oct 05 2009 – 612 reporter Amanda Dell went to see some very bleary eyed, yet enthusiastic game makers in action.